The classical approach has roots that date back to the Middle Ages. It is based on three stages of teaching called the Trivium. After younger children have a preparing stage learning the three R’s, they begin the Grammar Stage (ages 6-10) where they focus on absorbing information and memorizing the rules of phonics, spelling, grammar, foreign language, history, science, math, etc. The Dialectic Stage comes next (ages 10-12) where logical discussion, debate, drawing conclusions, research, algebra, and thesis writing is introduced. During the Rhetoric Stage (ages 13-18) systematic, rigorous studies continue as the student seeks to develop a clear, persuasive use of language. 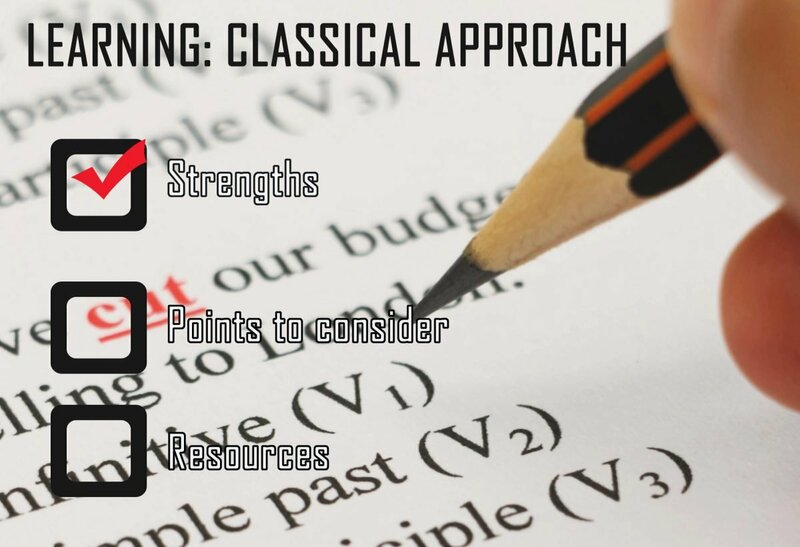 The classical method often incorporates Latin and Greek studies or current foreign languages. There is a strong emphasis on reading “Great Books” in a chronological fashion and a history notebook is kept so the student sees how their lessons fit together. Socratic dialogue is incorporated to encourage students to achieve a deep understanding of themselves and the world. A typical student’s day may be scheduled with: reading; writing; spelling; grammar; math; adding to a history notebook; logic and reasoning skills studies; memory work; Latin vocabulary; religious studies (if applicable); art; and, music study.